Changing Bits: Your test cases should sometimes fail! Thanks JMIke! Long time no talk! My Question is related to OpenNLP Integration with SOLR. And also iam able to compile source code, generated all realted binaries and able to create war file. But facing issues while deployment of SOLR. Hi, could you ask this on the solr-user@lucene.apache.org list? But each it is building again , which overrites my schema & solrconfig . 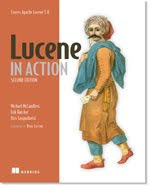 Can you ask on the solr-user list (solr-user@lucene.apache.org)? Can you please help me with this .